This has been a week full of tragedy – the fire at Grenfell Tower. There has been an appalling loss of life and acts of amazing heroism. This was not a natural disaster. It was avoidable. Everyone, rightly, is praising the emergency services. Fire fighters going into a burning building. Their bravery is beyond words. 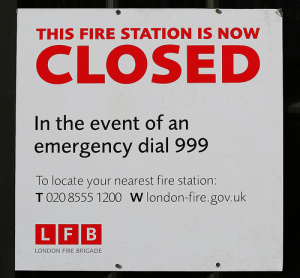 But it was not so brave to close the three fire stations nearest Grenfell Tower. There are 5,000 fewer fire fighters than there were 5 years ago. There has been a 25% reduction in fire prevention visits. 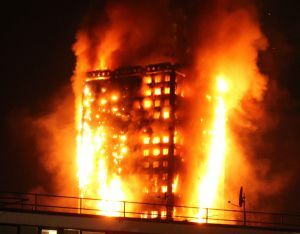 There has also been a 15% increase in the last year in the number of fire-related deaths in the UK, from 264 to 303. If you put money before lives, people die. What would Mary Seacole do today? ​On International Nurses Day, I have been thinking about what nursing means in our troubled world. And how nurses through the ages and across the planet have devoted their lives to helping others. 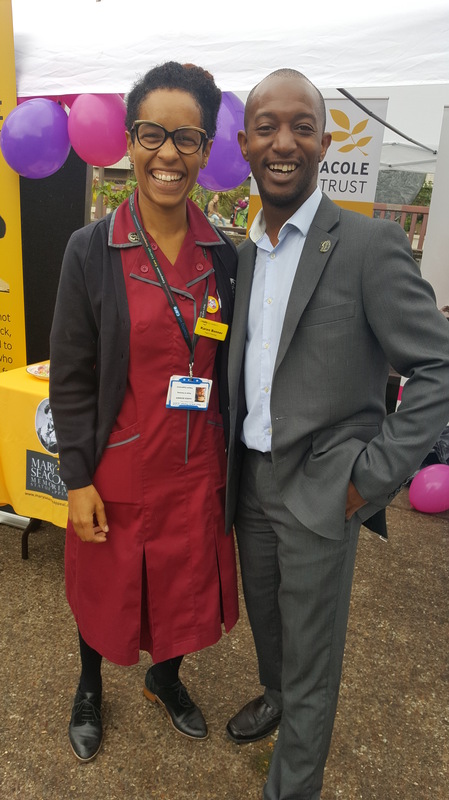 It was lovely for the Mary Seacole Trust to be invited by one of our trustees Karen Bonner to hold a stall at St Thomas’ Hospital as part of the Guys and St Thomas’ NHS Foundation Trust’s International Nurses Day celebration. Our display was right by Mary’s beautiful statue. We sold books and badges and signed people up to our mailing list. But most of all we talked with nurses and members of the public about the legacy Mary Seacole has left us. Despite all the challenges she faced, she refused to give up on her mission to help the sick and dying, including soldiers in the Crimea fighting a world war. She knew that nursing, in the 1850s not yet a recognised, respected profession, is so much more than delivering medicine or other treatments. It is about being with people in life and also in death. It is about combining compassion with practicality. And it is about speaking up when something is wrong and fighting for the rights of those at the bottom of the pile. Mary continues to be a role model for millions of us. As a middle-aged woman of colour, she knew discrimination and hardship. Mary’s mother was a free-woman in around 1805 when Mary was born, having previously been a slave. Mary experienced racism when she came to the UK, as well as many other challenges and setbacks. But through her courage, tenacity and entrepreneurship, she gained recognition and gratitude not just from those she nursed, but also the British government and media, and even Queen Victoria herself. And yet Mary died in penury. It is only recently that her legacy has begun to be recognised. Some of the skills and knowledge I acquired as a nurse from 1973 – 2000 remain with me, although I would need considerable retraining if I wanted a job in nursing today. The same would apply to Mary. But the core qualities and values needed to be a nurse have not changed. The ability to listen without judging. To see the person not just their disability or disease. To stand up for those who cannot stand up for themselves. Never to give up on anyone. And to seek out and build on the shared humanity that brings us together rather than the differences that can drive us apart. Were she alive today, on International Nurses Day 2017, I wonder what Mary Seacole would do? And as I look at her statue as she strides calmly but resolutely towards the Houses of Parliament, I can almost hear her telling me and others who have chosen to become nurses never to give up on our fellow humans. Because we are all part of one human race. ​My first blog for a month. A number of lovely people have been in touch to check if I am ok. They know that going quiet can be a bad sign with me. The reasons for my recent radio silence are several. I admit that I have had one or two days of lower than optimum mood. Nothing terrible, just feeling a bit bleurgh. This came as no surprise; my mood tends to reflect the lack of daylight at the start of the year. As usual, I am perking up with the lengthening of days. I have also been busy. Family stuff, domestic projects, volunteering and my coaching work. As a coach, it is important that I practise what I preach, and develop non-preferred ways of thinking, doing and being. By nature I am an extraverted thinker; I tend to work things out by writing about them or talking them through. What comes naturally to an introverted thinker, ie working out ideas fully before expressing them, takes considerable concentration and effort on my part. But I can do it when I need to. And I have felt that need recently. I have also been thinking about the nature of mental illness, and how some of us are prone to it while others seem to have greater immunity. I tend to agree with those who say that that there are few people, if any, who, faced with enough mental trauma, would not crack under the strain. Some of us simply experience mental distress more readily than our fellow humans. But despite all the evidence about the impact of genetics, other inherited traits, early experiences of trauma and loss, plus environmental factors, to have a tendency to experience mental illness is still seen by some as an indulgence, a weakness, even a personality flaw. Those who, despite all that has come their way, have learned to tame their mental health, are heroes in my opinion. They should be admired for their assets, not pitied or shunned for their deficits. Many are the kind of people you would most want to be stuck on a desert island with. They are kind, resourceful and patient, and often less prone to judge others than those at whom life has thrown less excreta. I have also been thinking how lucky I am. 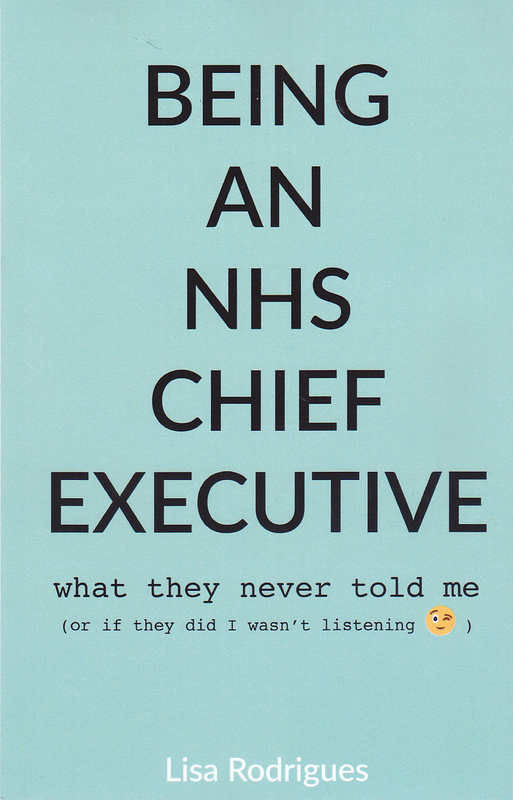 When I was last off sick with depression (from my old job as an NHS chief executive), I didn’t want to be alive. But I wasn’t worrying about paying the bills, losing my job or being made homeless. A few nameless folk were judgemental, but the ones who mattered most were hugely supportive. I got excellent treatment when I needed it from a wonderful psychiatrist and GP. When I was ready, I had the wherewithal to pay for psychological therapy. And as I got better, I didn’t have to waste precious emotional resources fighting a hostile benefits system. Nor did I find myself in accommodation where I felt unsafe, or removed from a caseload because I no longer met their treatment criteria. And I had no fears of deportation or having to hide from an abusive partner, people traffickers, drug dealers, pimps or lone sharks. It is true that mental illness can happen to anyone. If we can find the strength, most of us can do something to help ourselves. But people who are lucky like me have many times more chance of a meaningful recovery and successful management of relapses than those who have been dealt a less favourable hand. It was always so. And as austerity sinks its vicious fangs ever deeper into public services, it is those who already have the least who are most negatively affected. Instead of achieving their optimum, they are diminished and disabled, not necessarily by the condition itself, but by the need to fight battles every day, the lack of immediate and ongoing support, and by not having all the other things people like me take for granted. And that is why I have been quiet. I have been thinking about this a lot. I am privileged in so many ways, including having a voice. And I feel I have a responsibility to make use of it. If, like me, you experience depression from time to time, you will know about bad days. They come and they go. Some are worse than others. On the very bad ones, it may be impossible to speak, even move. It is not always the case that an accumulation of bad days will build up into a severe depression. But they might. What is unfortunately true is that, on bad days, we may do things that we later regret. We may hurt ourselves, others or both.We may damage relationships and opportunities. And we may develop destructive habits that are hard to break, especially when the next bad day comes along. If we are lucky, the good days outnumber the bad ones. On good days, it is easy to pretend that the bad days don’t happen. Or to forget what they are like. And the reverse is true also. On a bad day, we can believe that we will never feel calm or happy again. Today is a good day for me. And so I am making myself think about the things I would like to remind myself of when the next bad day comes along. Accept that this is a bad day. Embrace it. Only do what you must. Cancel things that you can cancel for the next couple of days to give yourself some breathing space. This will probably include asking for help, which can be really hard. Plan to go out for a little walk – if not today, then the next day. Or the one after. You will know when. Tell someone you trust how you are feeling. I know this is the hardest part. But please, do not avoid this. This is only my list. It might help you. But, even better, you might want to write your own. If you do so, I would love to hear whether you found it useful. Remember this; we are not alone. P.S. A few hours after posting, someone v wise pointed out to me that those with caring responsibilities don’t have the luxury of “duvet days” (they didn’t call them that but I know what they meant.) So I have amended the Do list slightly. It is still only my list. I don’t recommend any of it really. But I do recommend that you consider writing your own.